As coordinators at two of the nation's top programs can attest to, former Ohio State center Mike Brewster's leap of faith in an attempt to get hired represents what separates candidates in the crowded field of entry-level college football coaching jobs. 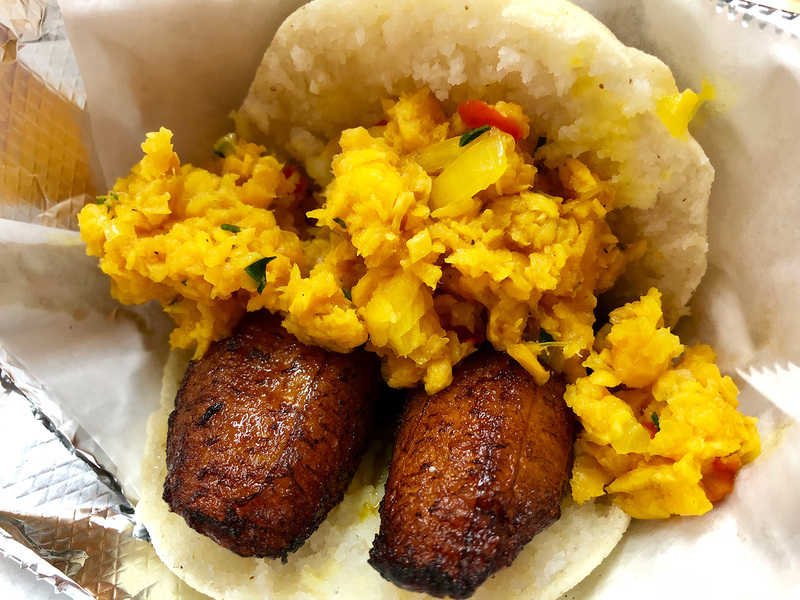 Plus, not-so-subtle advice for schools to curb falling home attendance figures, arepas in South Florida and the rest of this week's Punt, Pass & Pork. Until last month, I’d never called a phone number that I’d found on a men’s room wall. Of course, none of the other numbers were attached to a résumé that included Jim Tressel as a reference. Mike Brewster didn’t originally plan on posting copies of his résumé on the wall above the urinals in the highest trafficked men’s room at the American Football Coaches Association convention, but desperate times called for a little ingenuity. Brewster had carefully assembled résumé packets before traveling from Orlando to Charlotte, but he had quickly realized he had to scrap his original plan if he wanted to get his name in front of coaches who might hire him. A four-year starter at center for Ohio State who had spent all or part of four seasons on various NFL rosters, Brewster had been bitten by the coaching bug upon his retirement from football. He had spent the 2017 season working with the offensive line at Orlando’s Orangewood Christian. Orangewood’s head coach, Orlando prep legend Bill Gierke, had coached Brewster at Edgewater High. Brewster figured his next step was to try to land a graduate assistant job at the college level. So he took the GRE and devised a written presentation to hand to coaches at the convention. Instead, Brewster devised a surefire way to get his information in front of as many coaches as possible. Pee would meet CV. Brewster blocked out the phone numbers for references that included Tressel, the former Ohio State coach who is now Youngstown State’s president, and Jim Bollman, Brewster’s college offensive line coach who now serves as Michigan State’s offensive coordinator. Then he stuck them to the wall above a place almost every coach would have to visit at least once. So far, the placement hasn’t landed Brewster a GA job, but plenty of coaches saw his résumé. Three told me about it within a few minutes of walking into the convention last month. And the move should help Brewster’s case. Everyone else pegged their resumes to a board their targets probably wouldn’t read. Brewster quickly improvised and put his in a place where they were guaranteed to be seen by everyone. That’s the kind of ingenuity that can help a coaching staff, and it’s the kind of thing that helps separate a job seeker in a crowded field. But improvisational skill isn’t the only trait Brewster will need as he embarks on his college coaching adventure. The field is tough to break into, and it has gotten tougher as the salaries at the highest level have risen. Everyone wants to make Jimbo Fisher money—or Dave Aranda money for the aspiring coordinators—but the path to those millions is littered with low-paying, heavy-workload jobs that chew up and spit out those who just want to get rich. The ones who make it are the ones who don’t plan to make any money but know they’ve found their calling. Brewster and the other job-seekers like him can take some advice from those who have already climbed the ladder. One of the best pieces of advice? Coach because that’s what makes you happy, not because it might pay well. Penn State offensive coordinator Ricky Rahne learned that lesson after he graduated from Cornell in 2002. As a senior, he had been the quarterback on a 2–7 team. “It just kind of sucked the life out of me with football,” Rahne says. “I just felt like I needed to get a real job.” Rahne also had thousands of other reasons to go for the sure paycheck. The Ivy League doesn’t give athletic scholarships, and the bills were about to hit his mailbox. “I had a lot of student loans to pay,” he says. So Rahne took a job in the management training program at Cintas, an industrial uniform company. He stayed in that job about a year, but he remembers more about what he did after work. “I was playing in three different flag football leagues,” Rahne says. “I was playing on a softball team or a basketball team depending on the season. That was the only thing I looked forward to all week. Everything else was just corporate drudgery.” Rahne thought he might be homesick, so he transferred back to his home state of Colorado. Rahne’s girlfriend Jennifer (who is now his wife) pointed out that he was just as miserable in Colorado. She suggested that he might want to do something different with his life, and she had an idea what that was. She began scouring sites such as FootballScoop.com and CoachingSearch.com to find all the head coaches who had started new jobs and needed to fill out their staffs. She also looked for openings on other staffs. She sent her future husband’s résumé to all those coaches. One coach in a new place in 2004 was Tom Gilmore. The former Lehigh defensive coordinator had just become the head coach at Holy Cross. Gilmore remembered Rahne from a 2001 game against Cornell. Lehigh had won 38–35, but Gilmore admired Rahne’s toughness. So he gave Rahne a call on a Friday and told him he needed to be in Worcester, Mass., the following Monday. Rahne tried to call his manager at Cintas to discuss the situation but couldn’t reach him. Finally, he packed a few things and started driving east. From the road, he left a message on his manager’s voicemail. “I’m not coming into work on Monday or ever again,” Rahne says. He arrived at Holy Cross to find out that the offensive position he thought he’d be getting was actually an assistant defensive line coach job. It paid peanuts, and it was on the wrong side of the ball, but it was a coaching gig. Rahne reported to the defensive line coach to begin work. That guy’s name? Sean Spencer. If it sounds familiar, it’s because Spencer currently coaches Penn State’s defensive line. “I learned quickly that energy is an important part of the business,” Rahne says of Spencer. Rahne also cherishes the year he spent on defense before returning to his alma mater to coach running backs. It helped him teach offensive backfield players what to look for when scanning a defense, and it helped him teach tight ends how to block defensive linemen. Brewster wants to coach offensive line because he wants to teach the skills that Bollman taught him at Ohio State and Andy Heck taught him with the Jacksonville Jaguars, but what if a job comes open with a different position group? He should consider it. It worked for Rahne. Elliott coached at South Carolina State for two years. Then he moved up to Furman. In 2011, he was hired at Clemson to coach running backs. Less than six years later, he was calling plays for a national champion. Every path to the top of the coaching profession is different, but nearly every one starts somewhere humble. Brewster’s path began on the men’s room wall. It’ll be up to him to decide where it leads, but one of the references on that résumé seems certain he’ll succeed. This tweet from Raleigh radio host Lauren Brownlow got me thinking about lyrical dissonance. That inspired a discussion on Twitter, and it gave reader Sean an idea. Pina Colada song is pretty much the worst song ever if you actually listen to the lyrics. Do I smell a random ranking in our future? So without further ado, here are the top 10 songs in which the notes tell a happy story and the words tell a sad one. The do-do-do chorus makes it sound like summer jam fluff, but the words quite clearly state this is a song about the horrors of crystal meth addiction. Had the more graphic third verse been included in the radio version, more people might have noticed this. Andre 3000 crammed a story about a dying relationship into the most danceable song of the past three decades. The song is about how ugly its singer’s significant other is. Never play this for your Valentine. Sample lyric: There was blood and a single gun shot/But just who shot who? It’s peppy! It’s up-tempo! It’s Barry Manilow! It’s about ... a murder. This jerk is cheating on Josie (who is on vacation) and has no intention of anything more permanent with the acquaintance he’s using for immediate gratification. This woman treats our singer horribly, but he keeps coming back. The proof is right there in the chorus, but those horns just sound so happy. More happy horns. This time, they obscure an examination of a mid-life crisis. This lady knows her significant other is ready to move on, but she can’t let it go and is starting to venture into stalker territory. 1. Michigan has hired former Florida coach Jim McElwain to coach receivers, McElwain told ESPN’s Chris Low. McElwain also will help coordinate the offense and design offensive game plans, which should be interesting considering the Wolverines already have an offensive coordinator (offensive line coach Tim Drevno) and a passing game coordinator (Pep Hamilton). Late last year, McElwain reached a buyout settlement with Florida for $7.5 million. According to Low, that agreement didn’t include mitigation. That means McElwain will still get the same amount from Florida no matter what Michigan pays him. 2. Quarterback K.J. Carta-Samuels is headed to UCLA as a graduate transfer. Carta-Samuels, who backed up Jake Browning at Washington, plans on enrolling at UCLA in time for spring practice. That will allow him to compete for the starting job in coach Chip Kelly’s first season with the Bruins. The competition for Carta-Samuels includes rising sophomore Devin Modster, who started two games last season in place of an injured Josh Rosen. Sophomore Matt Lynch, redshirt freshman Austin Burton and true freshman Dorian Thompson-Robinson also will vie for the job. 3. Jarren Jasper, the teenage son of Navy offensive coordinator Ivin Jasper, returned home last week for the first time following a heart transplant. Dennis Dodd of CBSSports.com brought us an interesting story last week about a large attendance drop in college football from 2016 to ’17. We’re going to keep seeing these stories, because games have gotten very expensive while the television experience keeps getting better. Attendance will keep falling for those reasons, but that doesn’t mean the drops can’t be mitigated. I’m going to put on my consultant hat and offer the athletic directors out there some foolproof advice to put more butts in the seats. Sometimes, I see an item on a menu that I know will make a great story. Maybe it’s a tower of meat between two overwhelmed slices of bread. Maybe it’s an unlikely combination of ingredients that works perfectly, like the peanut butter and jelly burger at Slater’s 50/50 in Southern California. Or maybe it’s an ingredient that I don’t often see on a menu. When I opened the menu at Dona Arepa, I saw an item that fit two of those categories. Baby shark and sweet plantains stuffed inside a grilled corn cake pocket? That sounded like a tremendous story. I love ripe plantains. I love the corn cake that provides the carbohydrate backbone for an arepa. Unfortunately, after a few bites, I realized I don’t love baby shark. I could lie and tell you it was amazing, but it was too bitter and didn’t play well at all with the sweetness of the plantain. So my shock value menu item story was dead. Fortunately, the other arepas at this tiny Venezuelan spot in Greenacres, Fla., are wonderful. There is no need to for shock value when a place makes one of the treasures of Latin cuisine so well. If you prefer a taco in a corn tortilla, you’ll love an arepa. It also uses corn flour, but the dough is much thicker. What emerges is a cake that can then be split and stuffed with all manner of meat and cheese. Southerners who grew up with hoecakes will appreciate the taste and texture immediately. 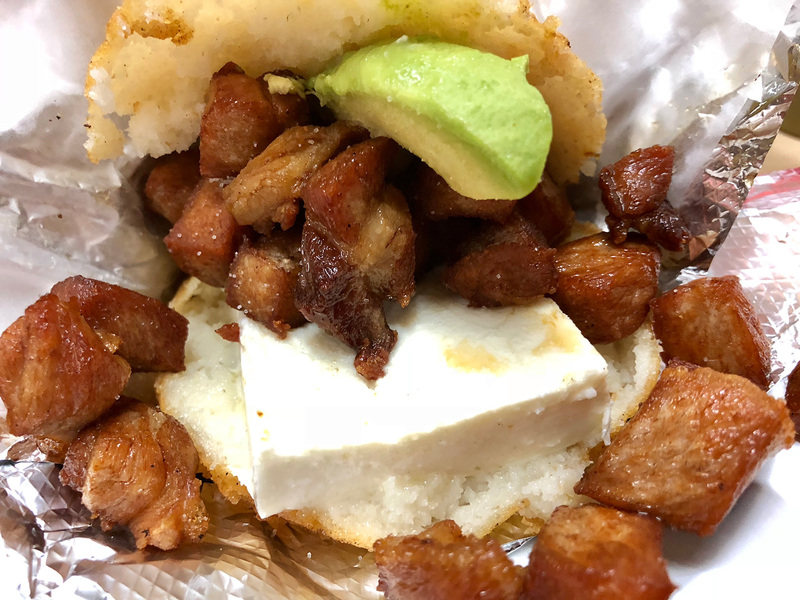 After my shark arepa fizzled, I dug into a Junquito, which packed fried pork, Guyanés cheese and avocado into a fried arepa. I added a tiny drizzle of the house-made hot green sauce and went to heaven. The cheese tastes and feels a little like buffalo mozzarella, and that softness meshes wonderfully with the crispy pork. 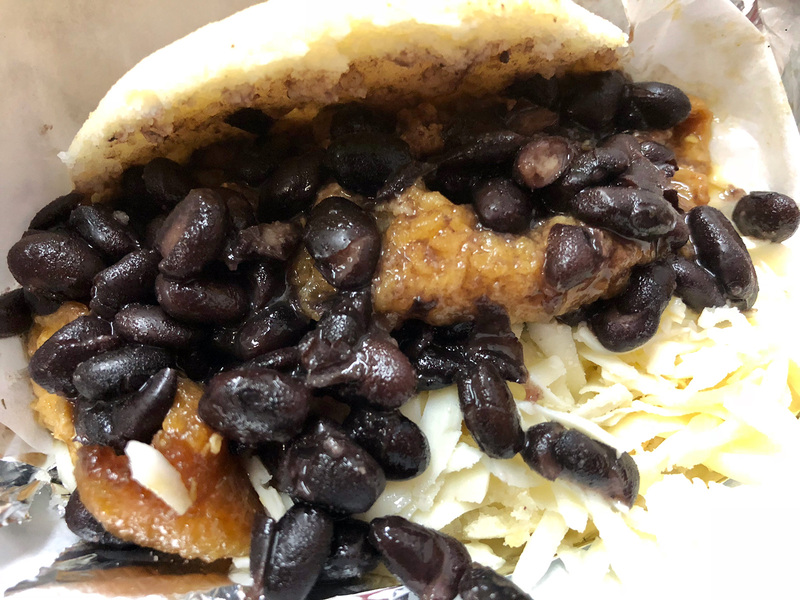 The avocado smoothed out the fire from the sauce, and it all soaked into the arepa, which remained just slightly crispy on the outside and soft and chewy inside. My server wasn’t sure if she should bring the third item because she assumed I hadn’t realized that each arepa is quite large. I assured her I could handle it, and she brought me a Vemex, which features pork skin in a hot green sauce with black beans and cheese. She said some customers didn’t like the Vemex because they expected crispy pork skin more like the Junquito. Based on the menu, I expected the same thing. The actual dish includes pork skin cooked in the green sauce. It’s not crispy, but it’s still delicious. Texture surprises don’t usually end well, but in this case that beautiful sauce eased any concerns. Now I need to go back and try the rest of the arepas. Dona Arepa will fill those cakes with just about anything, and I need to find out what combination works best.